Krill are small crustaceans that drift on currents. However, they migrate vertically in the water column. 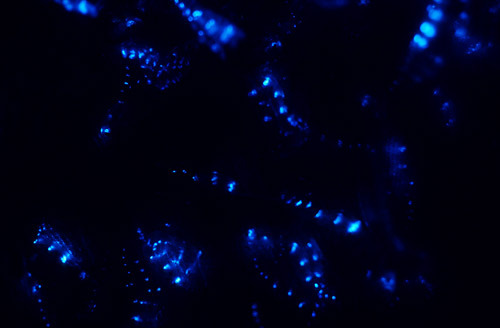 They create bioluminescence that can twinkle across large areas of water as they swarm. This species, Nyctiphanes australis, is abundant in New Zealand waters. It is an important prey for some marine mammals, seabirds and fish, as well as squid and other invertebrates.